It takes not just elected leaders, but regular people like you and me to make change. 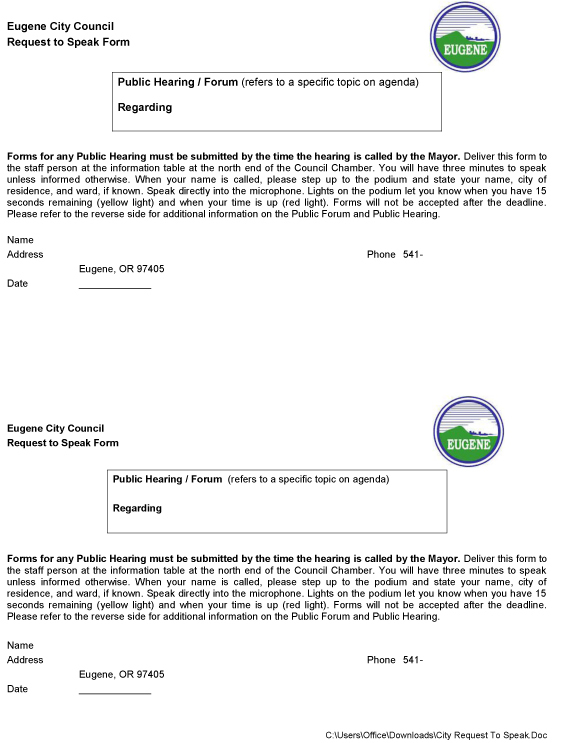 You can make “public comments” at your local City Council meetings and your comments may sway the way that City Council members think about and vote on certain issues. Going to a local council meeting and sharing your views can not only help spread awareness but it also connects you to people in your community. The City Council Public forum is held on the 2nd & 4th Mondays of each month, 7:00 pm at Harris Hall, Public Service Building, 125 E 8th Ave. Citizens can address the Mayor & City Council on any topic not on the agenda. SEN Board member Duncan Rhodes has created an electronic version of the form for those who wish to fill out their forms in advance and avoid the lines on busy evenings. Download in JPG or MS Word. October 9, 2015 in Meetings.